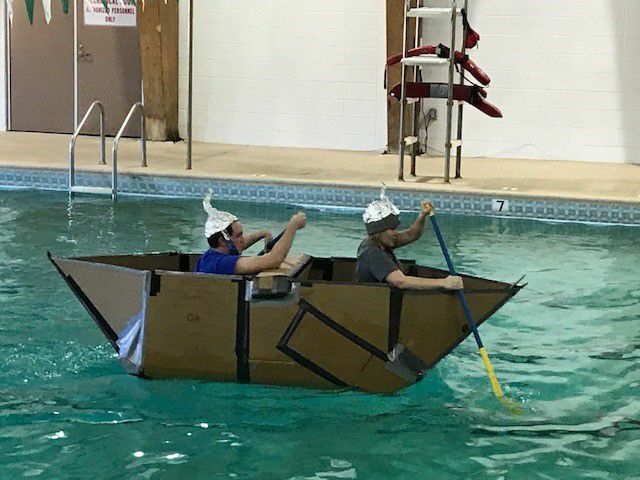 Coconino High School AP Physics students participated in the annual cardboard boat races last week. Each team of two must build a “seaworthy” boat out of cardboard and duct tape. If their boat makes it three laps across the pool then more passengers are added until the boat sinks. The team whose boat holds the most weight before sinking is the champion. Coconino High School AP Physics students try to make it across the pool before their cardboard boats sink. Coconino High School AP students paddle their cardboard boat across the pool. A cardboard boat made by Coconino High School AP Physics students breaks. Coconino High School students try to evacuate their boat before it sinks at the annual AP Physics class' cardboard boat races. Coconino High School AP Physics students try to cross the pool before their cardboard boat sinks.